I explored many fields in graphic and design. I graduated at Istituto Statale d'Arte of Urbino and specialized in 3D Animation. I worked for RAI and Mediaset in the field of 3D special effects and she was member of the Adobe Guru for the digital video area. 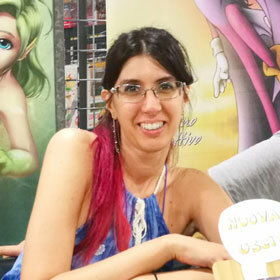 She gave courses on comics and digital painting, she worked on graphic design, web applications and multimedia. I started to freelance in 2011, published the comic series "Niki Batsprite" (10 full color books, ongoing) and specialized in comics and illustrations. I teache comics and manga and cooperates in various projects: from movies ("Der Urbino Krimi" by Studio Hamburg) to 3D prototyping and printing. 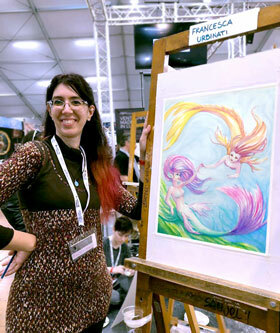 Since 2013, I perform live painting in the Area Performance during the Lucca Comics & Games event. I was selected among international artists by ArtOrder LLC of Jon Schindehette, former Art Director of Dungeons & Dragons, for the artbooks "Tiny Dragons". Through "Touched By Art" I offer free advices and resources for indie authors and artists.